A controversial scheme offering pregnant women in South Tyneside up to £300 to stop smoking has helped almost half the number using cigarettes. Under the Smoking in Pregnancy Incentive Scheme, expectant mothers can claim a £25 gift card just for attending an initial appointment and setting a quit date. From the scheme’s launch in March 2017 to the end of December, 249 women signed up - and at least 137 managed to go four weeks without lighting up. Tom Hall, South Tyneside Council’s director of public health, told health chiefs: “We’ve seen continued strong improvement around smoking in pregnancy. We started in 2014/15 with a rate of about 25 per cent. Mr Hall was speaking at a meeting of South Tyneside’s Clinical Commissioning Group (CCG). The council, which is responsible for public health, has set a target of 11 per cent of women smoking during pregnancy by 2020. According to figures provided for the meeting, the rate in December was 13.5 per cent - down from 25.3 per cent in 2014/15. 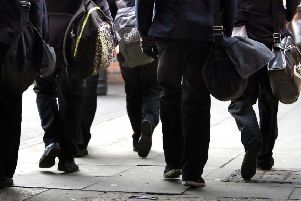 While this still puts South Tyneside above the 10.5 per cent national average for England, it is lower than the average for the North East and Cumbria of 15.4 per cent. By August last year 177 women had signed up to the incentive scheme and received at least one voucher, with payouts totalling £19,550. Following a first appointment, women who enroll in the scheme can be eligible for up to three further instalments – one of £75 and two of £100 – which can be spent at stores such as Mothercare, Halfords and Boots if they can go 35 weeks without a cigarette. Dr David Hambleton, the CCG’s chief executive, said the borough is beginning to be recognised for its public health projects. He said: “I think people are starting to realise South Tyneside behaves quite differently. “We’re starting to get people coming to see us and say ‘how are you getting this to work?’ or get partners collaborating. Coun Tracey Dixon, cabinet member for independence and wellbeing, said: “The council and its partners are committed to driving down smoking rates among pregnant women, and these figures show that our approach is having a positive impact. “Smoking in pregnancy is known to cause significant, yet completely avoidable, poor health in children and mothers. According to the NHS, cigarettes contain about 4,000 different chemicals which can restrict the supply of oxygen to babies and cause other damage. They can increase the risk of cot death, complications such as premature birth, low birth weights, or stillbirth.